202 records – page 1 of 5. 16 p. : ill. ; 21 cm. 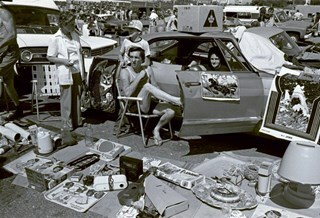 Photograph of a group of people together at a vendor's blanket filled with children's toys and crafts the Lougheed Drive-in swap meet in the summer of 1978. 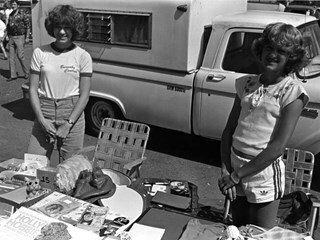 Photograph of two young girls standing next to their swap meet table filled with toys and games at the Lougheed Drive-in swap meet in the summer of 1978. Photograph of two unidentified British Columbia (BC) Transit workers carrying toys and board games for the "Toys for Tots" toy drive. Note in black and blue ink on recto of photograph reads: "12/20 BNW - p.3 / A 3591 - Bby - Simone / 88%"
Photograph of Terrence Hannigan in his pedal car in front of Central Park Theatre. Photograph of six year old Terrence Hannigan in his pedal car on the wooden plank sidewalk in front of Veteran's Grocery Store. Note on verso of photograph reads: "6 years"
Stamp on verso of photograph reads: "IVORY FINISH 732"
Photograph of three unidentified babies in a row, lying down or sitting up on blankets laid out on grass. There are pillows and toys near the babies. Visible in the background are windows on the side of a building. inscribed in pencil, verso, c. "14"
Photograph of unidentified women are standing by the door of a house, and a child is riding on a rocking horse on the porch. The image is duplicated in a double exposure. printed on the cover, recto, b. "GRACE HOSPITAL/ VANCOUVER, B. C.", verso, c. "Grace Hospital/ VANCOUVER, B. C.", l.l. "Baby", l.r. "Age [2 written in with blue ink]Days", inscribed in blue ink, b. "To Grandpa./ Isabel Lynne." Photograph of a two day old infant squirming on its blanket on a bed. Behind the baby is a window with blinds pulled down. There is a day calendar at October 29th, and a bunny doll resting on the window ledge. The photograph is mounted inside a Grace Hospital birth announcement card. Grace Hospital opened in 1927 at 26th Avenue and Heather Street in Vancouver. The inscription on the card identifies the baby as Isabel Lynne. 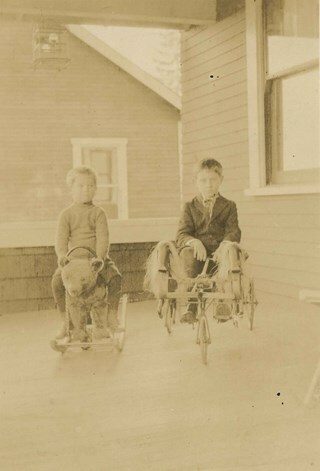 Photograph of two Hutton boys, Gordon and Norman playing on their toys on the porch of their house near Bosnor Park; near Lily and Fern Avenue. Norman is riding a rocking horse in the shape of a bear, and Gordon is riding a bicycle in the shape of a horse and carriage. 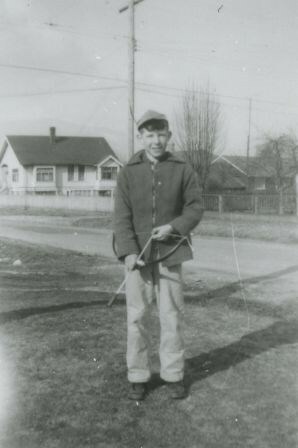 Photograph of Doug Cary, age 10, holding a bow and arrow in the side yard of 311 Madison Avenue. Albert Street is visible in the background. 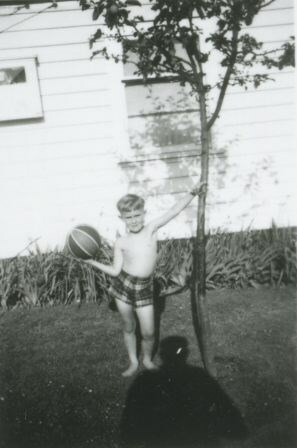 Photograph of Ian Taylor holding a ball at 4207 Triumph Street. Photograph of Lyle LeGrove standing outside of 2224 Antrim Avenue (later renumbered 6957 Antrim Avenue). He may be holding a baby rattle. A house can be seen in the background. 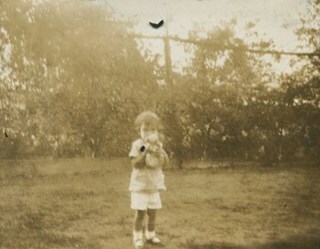 Photograph of a child babysat by Mrs. I.R. King (nee Spraggon) standing beside a house on the 3900 block of Union Street, holding a toy. Photograph of Robert C.K. Peers on rocking horse. This photograph was taken at Yellow Point, BC. Photograph of two boys (identified as Rod and Ian Freebairn-Smith) with a kite. 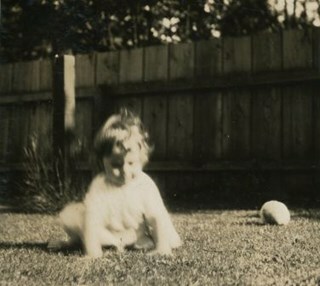 Photograph of Robert Peers at fourteen months old, playing in a yard at an unspecified location, although it may be the home of his parents, Bob and Kitty Peers, on Deer Lake Avenue. 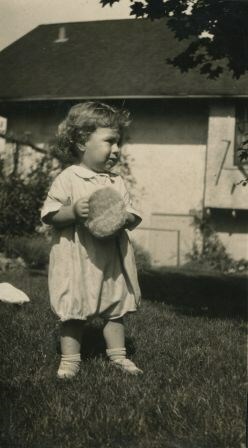 Photograph of Robert Peers standing in the lawn of a home, holding a toy. This may be his parent's home on Deer Lake Avenue. 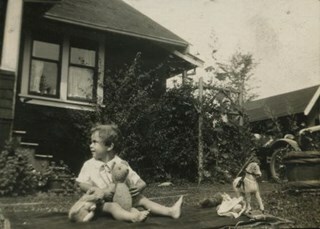 Photograph of Robert Peers with an unidentified woman, sitting on a blanket with a few toys lying around on the ground. 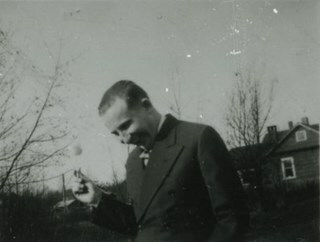 Photograph of Robert Peers standing on the grass in front of a row of trees, holding a toy. 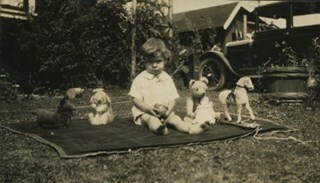 Photograph of Robert Peers sitting on a blanket on the grass, with a number of stuffed toys. Toys include a teddy bear, rocking horse, and dolls. A car and house can be seen in the background. This photograph may have been taken at the home of Annie Hill, Roberts' grandmother, on Deer Lake Avenue. Photograph of Robert Peers on the lawn in front of a house. He is seated on a blanket with a number of stuffed toys. This photograph may have been taken at the home of Annie Hill, Roberts' grandmother, on Deer Lake Avenue. 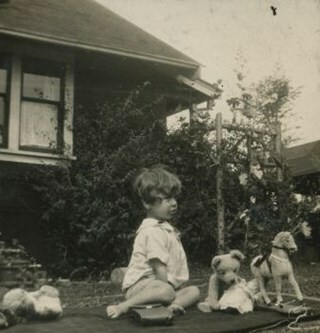 Photograph of Robert Peers seated on a blanket in the front yard of a house. He has next to him a number of stuffed toys, including a teddy bear, dolls and small rocking horse. 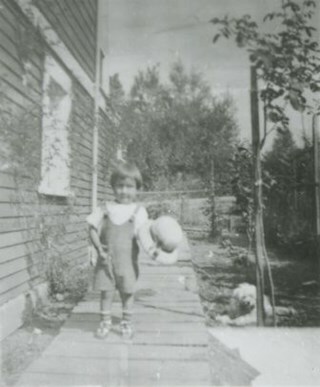 This photograph may have been taken at the home of Annie Hill, Roberts' grandmother, on Deer Lake Avenue. Photograph of Robert Peers seated on a blanket in the front yard of a house. 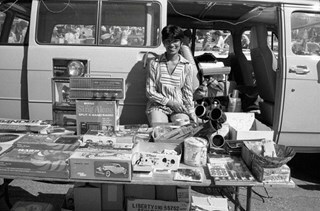 He has a number of stuffed toys, including a teddy bear, dolls and small rocking horse next to him The front end of a car can be seen in the background (far right). This photograph may have been taken at the home of Annie Hill, Roberts' grandmother, on Deer Lake Avenue. 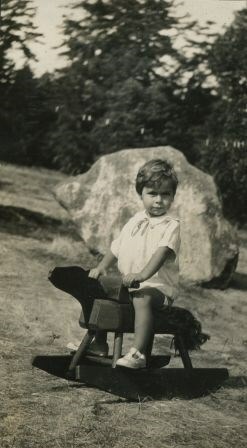 Photograph of Robert Peers sitting on a wooden rocking horse. 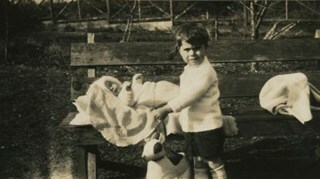 Photograph of Robert Peers standing next to his infant sister, Anne. Anne is lying on a blanket on a wooden bench and a toy dog can be seen at Robert's feet. 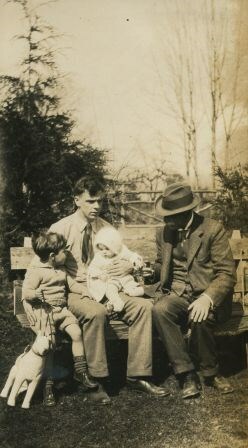 Photograph of Bob Peers sitting on a bench holding his infant daughter, Anne next to his son Robert. 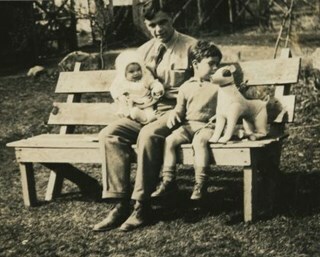 A toy dog can be seen sitting next to Robert. Photograph of (l to r): Robert Peers, his father Bob Peers, his sister Anne Peers and his grandfather, Claude Hill. Robert is holding a toy dog by a leash. Photograph of Robert Peers (right) seated next to his sister, Anne. Anne is propped up on a bench with pillows and a blanket and Robert is holding up a toy. 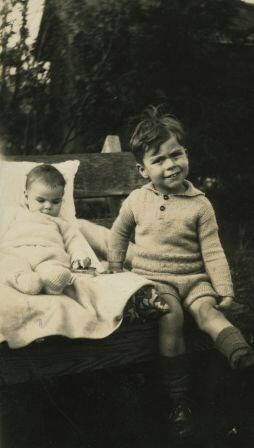 Photograph of Robert Peers (right) seated next to his sister, Anne. 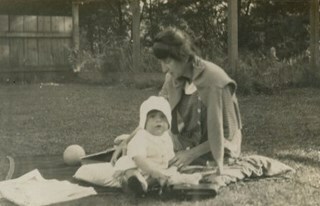 Anne is propped up on a bench with pillows and a blanket and a toy can be seen laying near her left hand on the blanket. 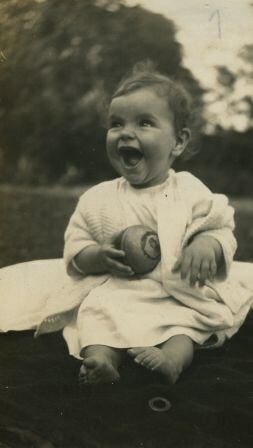 Photograph of Anne Peers, sitting on a blanket, holding a toy ball. 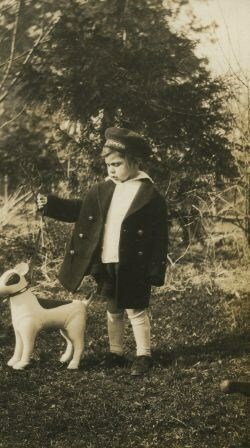 Photograph of Robert Peers holding a toy dog on a leash. Robert is wearing a sailor's hat the read: HMS Superb. 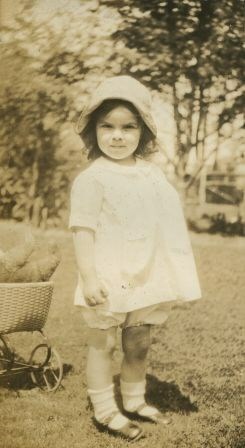 Photograph of Anne Peers standing in front of a basket full of toys. 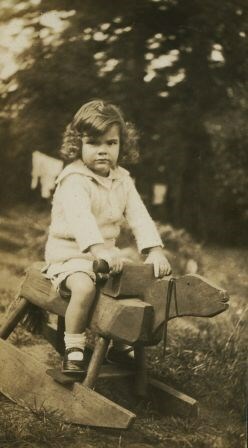 Photograph of Anne Peers riding on a wooden rocking horse. 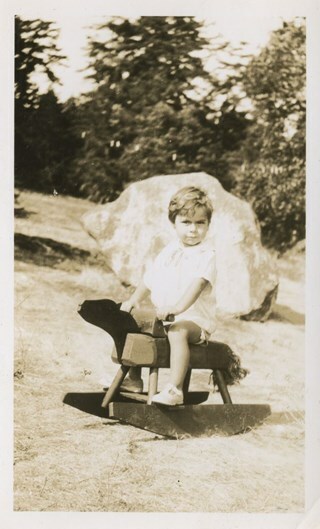 Photograph of Anne Peers seated sideways on a wooden rocking horse. 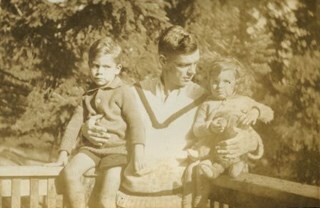 Photograph of Bob Peers holding his children, Robert and Anne who are seated on a railing. Anne Peers is clutching a teddy bear. 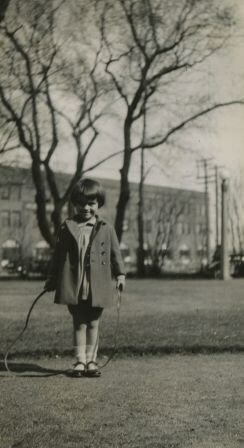 Photograph of Barbara (Babs) Peers playing with a skipping rope. 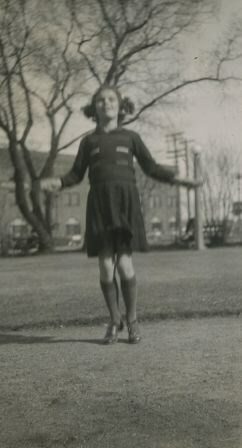 Photograph of Anne Peers jumping with a skipping rope. 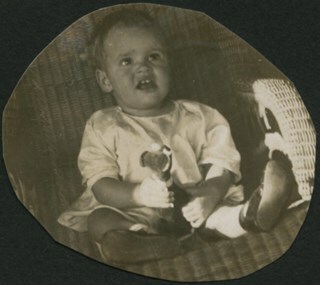 Photograph of a child sitting in a wicker chair and holding on to a plush toy. Photograph of the Gillis brothers (from left); Donald A. Gillis (holding a toy sailboat), Norman Montague Gillis and Boyd Leslie "Bud" Gillis. 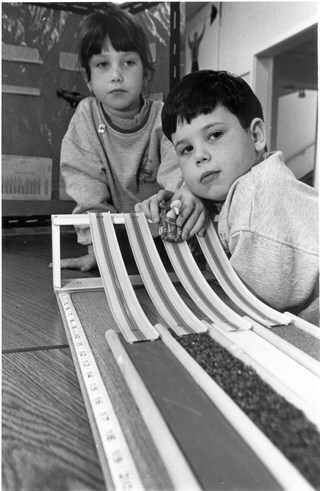 Photograph of Ann and Jonathan Martin playing with toy cars and miniature car ramps. Note in black ink on recto of photograph reads: "#780 Mario Bby / Bby p. 11 38%"
Toy car - Made by Chiko - Japan in late 1950's. Pressed tinplate with a friction motor. The car is red with chrome accents, interior is green with pattern. Driver at wheel. Used by Charmaine Yanko. It was a gift from Charmaine's uncle -- her dad's brother, Fred Yanko, who was less than a year younger than John Yanko. The Yanko family lived on Broadway in Burnaby. Annie D. Basiuk (later Yanko) was born on February 25, 1902 in Sheho, Saskatchewan (formerly Sheho, North West Territories). Daniel "Dan" Yanko was born in Kobilnicha, Ukraine in 1887 and immigrated to Canada in May or June of 1905. Daniel Yanko married Annie D. Basiuk and had thirteen children together. Their son, John Ivan Yanko was born on the family farm, near Kelliher, Saskatchewan, on June 27, 1923. In grade six, John was pulled out of school to help support the family. Eugenia “Jenny” Haresomovych (later Carman) was born August 8, 1904 in Galecia, Austria. 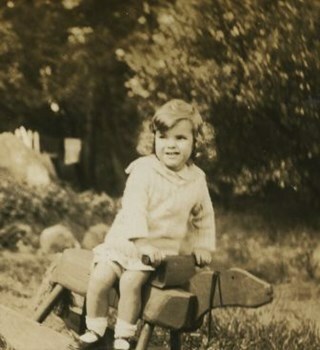 She came to Canada in 1928, when her parents sent her to live with the Austrian consular in Halifax. A year later, she was in The Pas with Albert Edward Carman, with whom she would have three children. Their daughter, Leida Doria "Lillian Doris" Carman was born in The Pas, Manitoba March 24, 1929. Eugenia “Jenny” (Haresomovych) Carman later re-married Joseph Nagy who was born in Hungary in October 3, 1900. Jenny, Joseph and the children moved to Nelson, British Columbia, where Joseph worked for the Canadian Pacific Railway. At the age of twenty, John Yanko met his future wife Lillian Doris Carman while visiting relatives in Burnaby. Lillian received a rail pass because of her dad’s employment with the CPR and at fourteen had gone to visit her Godmother in Burnaby. John Ivan Yanko and Leida Doria "Lillian Doris" Carman were married October 16, 1948 in Nelson, British Columbia and moved into the basement of John’s sister’s house on Union Street. Lillian began working at the downtown Woodward’s store as a cashier in 1948. In 1950, the young couple bought property at 7385 (later renumbered 7391) Broadway in Burnaby and began constructing a house as they could afford it. Knowing she’d be let go if she was pregnant, when Lillian was expecting her first child, Jenny sewed her several versions of the same outfit; they all used the same material, but each was a little bit larger than the last to accommodate her expanding girth. 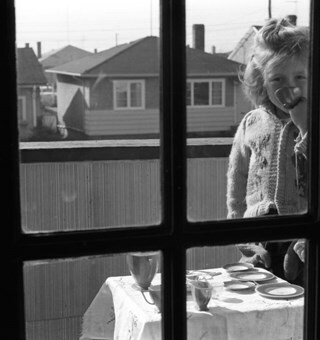 Rhonda, born in 1953 and Charmaine, born in 1955, grew up in the Broadway home. They attended school at Sperling Elementary, and later at Burnaby North high school. Lillian left her job to be a stay-at-home mom when Rhonda was born, but that changed in 1963 when John and Charmaine were in a car accident that left John temporarily unable to work. Joseph Nagy died April 20, 1962; his wife Eugenia “Jenny” (Haresomovych) (Carman) Nagy passed away August 14, 1985. Daniel "Dan" Yanko died in 1976; his wife Annie D. (Basiuk) Yanko died in 1997. John Yanko later returned to work, establishing his own tile setting business and working until age eighty-two. John and Lillian lived out the rest of their married lives on the Broadway property. John Ivan Yanko passed away in 2010; his wife Leida Doria "Lillian Doris" Carman (Carman) Yanko passed away in 2011. Blue cordoroy doll's coat with blue satin sleeves and red lining, six white buttons at front. From the Yanko family home in Burnaby. Made by Lillian Yanko for her daughters' dolls. Annie D. Basiuk (later Yanko) was born on February 25, 1902 in Sheho, Saskatchewan (formerly Sheho, North West Territories). Daniel "Dan" Yanko was born in Kobilnicha, Ukraine in 1887 and immigrated to Canada in May or June of 1905. Daniel Yanko married Annie D. Basiuk and had thirteen children together. Their son, John Ivan Yanko was born on the family farm, near Kelliher, Saskatchewan, on June 27, 1923. In grade six, John was pulled out of school to help support the family. Eugenia “Jenny” Haresomovych (later Carman) was born August 8, 1904 in Galecia, Austria. She came to Canada in 1928, when her parents sent her to live with the Austrian consular in Halifax. A year later, she was in The Pas with Albert Edward Carman, with whom she would have three children. Their daughter, Leida Doria "Lillian Doris" Carman was born in The Pas, Manitoba March 24, 1929. Eugenia “Jenny” (Haresomovych) Carman later re-married Joseph Nagy who was born in Hungary in October 3, 1900. Jenny, Joseph and the children moved to Nelson, British Columbia, where Joseph worked for the Canadian Pacific Railway. At the age of twenty, John Yanko met his future wife Lillian Doris Carman while visiting relatives in Burnaby. Lillian received a rail pass because of her dad’s employment with the CPR and at fourteen had gone to visit her Godmother in Burnaby. John Ivan Yanko and Leida Doria "Lillian Doris" Carman were married October 16, 1948 in Nelson, British Columbia and moved into the basement of John’s sister’s house on Union Street. Lillian began working at the downtown Woodward’s store as a cashier in 1948. In 1950, the young couple bought property at 7385 (later renumbered 7391) Broadway in Burnaby and began constructing a house as they could afford it. Knowing she’d be let go if she was pregnant, when Lillian was expecting her first child, Jenny sewed her several versions of the same outfit; they all used the same material, but each was a little bit larger than the last to accommodate her expanding girth. Rhonda, born in 1953 and Charmaine, born in 1955, grew up in the Broadway home. They attended school at Sperling Elementary, and later at Burnaby North high school. Lillian left her job to be a stay-at-home mom when Rhonda was born, but that changed in 1963 when John and Charmaine were in a car accident that left John temporarily unable to work. Joseph Nagy died April 20, 1962; his wife Eugenia “Jenny” (Haresomovych) (Carman) Nagy passed away August 14, 1985. Daniel "Dan" Yanko died in 1976; his wife Annie D. (Basiuk) Yanko died in 1997. John Yanko later returned to work, establishing his own tile setting business and working until age eighty-two. John and Lillian lived out the rest of their married lives on the Broadway property. John Ivan Yanko passed away in 2010; his wife Leida Doria "Lillian Doris" Carman (Carman) Yanko passed away in 2011. 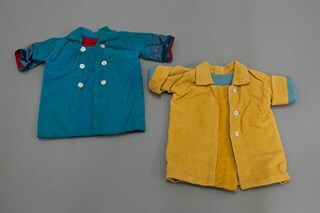 Yellow cordoroy doll's coat with blue lining, three white buttons at front. (a) Red plaid doll dress, pleated at waist with short elastic sleeves, flipped collar is navy, three white buttons at back. (b) Bloomers are red and white triangle pattern with elastic waist and matching red plaid trim at legs. 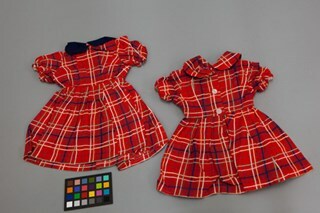 (a)Red plaid doll dress, pleated at waist with short elastic sleeves, flipped collar is red plaid with navy underside, three white buttons at back. (b)Bloomers are red and white triangle pattern with elastic waist and matching red plaid trim at legs. Light blue doll dress with pattern of girls, birds, and trees, pleated in front, white lace collar, two snaps at back. Light blue doll dress with pattern of girls, birds, and trees, pleated in front, white lace collar and sleeves, two snaps at back.